If a user is asked to pay for an item via PayPal, OLX sends a safety message to warn them. Local online classifieds site OLX says its investment in the latest tech security and a fraud detection team has resulted in the site blocking 200 000 scammers in the past 10 months. The online marketplace, which facilitates the buying and selling of almost anything on its Web site and app, has over 330 million monthly users globally. The classifieds site says last year it revamped security on its platform and introduced a team of dedicated fraud specialists and a fraud hotline to beef up security for its users. Through the use of sophisticated algorithms and machine learning which detect potential scammers on its chat platform, OLX says it has been able to decrease fraud incidents by 44% in the past 10 months. Thembani Biyam, country manager for OLX SA, explains: "We have worked hard to understand fraud behaviour patterns and use our technology to try to stop it. Globally, we noticed that the number of online chats far exceeded the number of phone calls. 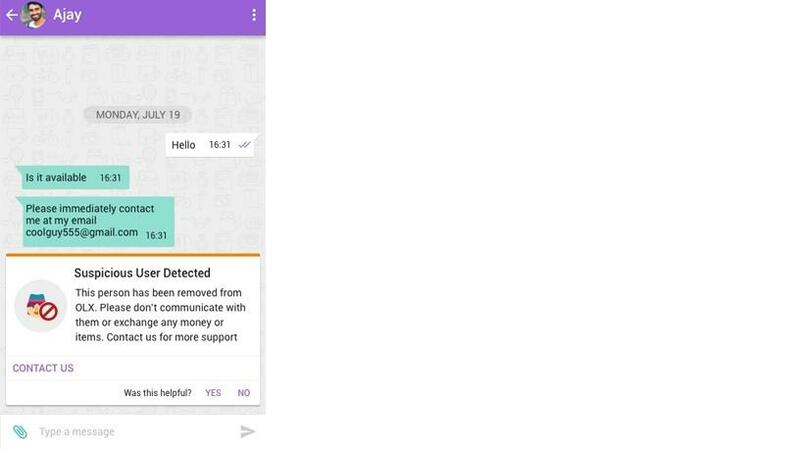 "The feedback we received from users is that chats are non-intrusive and familiar while keeping personal information private. So, we wanted to increase the safety within the chat by introducing technology to detect potential scammers and provide safety tips that follow current scam trends. Our specialists work round the clock to block scammers and fraudulent ads off our platforms." Biyam explains that sophisticated algorithms and machine learning are used to detect potential scammers on the site's chat section. For example, if a user is asked to pay for an item via PayPal before seeing it, a warning will be sent to the user with a safety tip. "Most scammers will try to move the conversation out of the chat function to e-mail or WhatsApp. At the point where they do this, OLX's safety tips are triggered, advising users to stay within the chat and to be aware that it may be a potential scam. Any time key words like 'PayPal' are mentioned, our safety messages pop up for the user and it's flagged in our system. We are able to instantly block user's profiles," he continues. Additionally, an automatic alert is sent to users when they are chatting with someone who has been flagged as suspicious, adds Biyam. In the past few months, the company says it has actively rallied its users and employees through an online campaign called #StaySharp to help in the fight against scamming. User centricity manager for OLX SA, Colette van Montfort, says: "We raised the bar last year in the level of user support we provide to our community by introducing a fraud hotline and a dedicated fraud team. Those efforts have paid off. Since June, the fraud team has blocked nearly 200 000 scammers from our site, and we still reached the highest number of unique ads in the past two years in the last quarter. Users are encouraged to report fraudulent activity, dodgy looking accounts or adverts. We have a report button across all platforms for this and users have helped in a huge way." Despite the increasing protection for online trades, classified players have become a breeding ground for scammers. Online customer service Web sites like Hellopeter.com and reportacrime.co.za are constantly being flooded with complaints about scams that occur on classifieds sites. However, many of these cases go unreported to the authorities or the relevant classifieds sites. The two main scams that usually occur on classifieds sites, according to experts, are related to car deposits and fraudulent proofs of purchase. Jobs scams are also popular online. SA's current economic climate has resulted in many consumers purchasing second-hand goods versus new. Local online classifieds service Gumtree is in partnership with escrow service Shepherd in an effort to make online peer-to-peer trading safer. Standard Bank-powered Shepherd holds money from the buyer, picks up the item from the seller, delivers it to the buyer and only releases money to the seller when they buyer is happy with the item on delivery. Gumtree also has a pay button to some of its sections, which allows buyers to pay for items without having to carry cash or meet the seller in person. On its Web site, OLX advises users on precautionary measures to take to avoid being scammed.